Students learn what makes a conifer different from other trees, study thirty-five vocabulary words, complete thirteen activities, and listen to a narrated lecture. 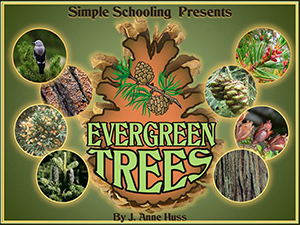 Simple Schooling Evergreen Trees is all about conifers. Students are naturally drawn to the “Christmas tree” symbol and will enjoy learning more about how these special trees keep their color all year long. Simple Schooling unit studies are always easy to use. This nature study unit can be made into a portfolio keepsake after students are finished. Simply use a single hole punch to punch through the guide holes at the top of each page, then bind together using yarn, ribbon, or metal binder rings. 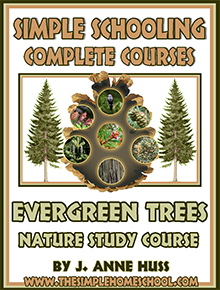 Students should read through the introductory text for evergreen trees and then read about each species individually. Have them study the pictures – pointing out the bark, cones, and needles for each one. When they have a good idea about the major characteristics for each species they can label the evergreen worksheets. The second project is a keepsake copybook. This activity allows the student to choose a few interesting facts about each evergreen species and write about them. They can also draw or cut out a picture of each species to use the empty space on the first page for each species. The final activity is a story poem about The Foolish Fir Tree. This story describes how the fir tree wanted to be something else and teaches a simple moral at the end. Students can complete the worksheets after the poem to test their memory of the story events. 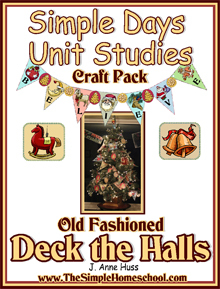 The Simple Schooling Old Fashioned Deck the Halls Craft Pack is the perfect kind of work to keep little hands busy and wandering minds at attention through the weeks leading up to Christmas. In this craft pack children can make holiday banners to deck the halls and ornaments to deck the tree! This product is 43 pages in length and includes instructions, examples, and designs to printout for an old fashioned Christmas! Ages pre-school and up. The file is VERY LARGE...so be patient. Click to get the K-12 unit study susbcription on sale. Simple Schooling will be selling the K-12 Subscription from Black Friday (November 29th) through December 13. This is the LAST TIME the K-12 subscription will be offered. Sale Prices for the remainder of the purchase window ($45 for the one year subscription - reg. price: $72.75) will be in effect from 12:01 AM Saturday November 30, through 11:59 PM Friday, December 13th. After December 13, NO MORE subscriptions will be sold until May 2014 during Open House. In May 2014 the following subscriptions will be offered, plus several new ones that target specific topics. IMPORTANT - If you currently have a subscription for the K-12 at the old site, THIS ONE WILL NOT ADD TO THAT. The reason is that every K-12 subscription (with the exception of one or two people who bought far into the future) will expire next December. This subscription is going away permanently and absolutely no more K-12 subscriptions will be sold after December 13th, 2013.